मध्य आशिया हा आशिया खंडामधील एक भौगोलिक प्रदेश आहे. इतर भौगोलिक प्रदेशांप्रमाणे मध्य आशियाच्या अनेक व्याख्या आहेत. सर्वसाधारणपणे मध्य आशियामध्ये आशियाच्या पश्चिम भागातील युरोपाच्या सीमेजवळील भूभागाचा समावेश केला जातो. ह्यांमध्ये भूतपूर्व सोव्हियेत संघाच्या विघटनानंतर स्वतंत्र झालेले कझाकस्तान, किर्गिझस्तान, उझबेकिस्तान, ताजिकिस्तान व तुर्कमेनिस्तान हे देश येतात. ह्या देशांची एकत्रित लोकसंख्या सुमारे ६.१५ कोटी इतकी आहे. काही व्याख्यांनुसार दक्षिण आशियातील अफगाणिस्तान व इराण तर पूर्व आशियातील मंगोलिया हे देश तसेच पाकिस्तानचा उत्तर भाग, भारताचा काश्मीर, चीनमधील शिंच्यांग हा प्रदेश व दक्षिण सायबेरिया देखील मध्य आशियामध्ये गणले जातात. मध्य आशियाच्या भौगोलिक रचनेमध्ये पर्वतरांगा (तियान शान), वाळवंटे (कारा कुम, किझिल कुम, ताक्लामकान) व वृक्षरहित गवताळ पठारांचा समावेश होतो. सीर दर्या, अमू दर्या व हरिरुद ह्या मध्य आशियातील प्रमुख नद्या आहेत. अरल समुद्र व बालखाश सरोवर हे येथील सर्वात मोठे पाण्याचे साठे आहेत. गेल्या अनेक दशकांमध्ये मध्य आशियातील नद्यांचे पाणी मोठ्या प्रमाणावर सिंचनाकरिता इतरत्र वळवण्यात आल्यामुळे हे दोन्ही पाण्याचे साठे झपाट्याने आटले आहेत. येथील पुष्कळशी जमीन ओबडधोबड व रूक्ष असून शेतीसाठी अनुकुल नाही. मध्य आशियाच्या मोठ्या भागात कोणताही पाण्याचा साठा नसल्यामुळे येथील हवामानामधील बदल तीक्ष्ण असतात. तसेच पाण्याची तीव्र टंचाई असल्यामुळे पाण्यावरून वाद व तंटे कायम आहेत. खालील देशांचे काही भूभाग मध्य आशियामध्ये गणले जावू शकतात. इस्लाम हा मध्य आशिया, अफगाणिस्तान व शिंच्यांग भागातील प्रमुख धर्म आहे. येथील बहुसंख्य लोक सुन्नी पंथाचे आहेत व अफगाणिस्तानाच्या काही भागांत शिया पंथीय अल्पसंख्य वस्ती आहे. इस्लामच्या उदयापूर्वी पारशी व बौद्ध हे मध्य आशियातील प्रमुख धर्म होते. सोव्हियेत संघाच्या कम्युनिस्ट राजवटीखाली मध्य आशियामध्ये मोठ्या प्रमाणावर औद्योगिकरण व पायाभूत सुविधा झाल्या परंतु त्याच बरोबर येथील स्थानिक धर्म व संस्कृती दडपण्याचे प्रयत्न देखील सातत्याने होत राहिले. (2009) The capital and second largest city in Kazakhstan. After Kazakhstan gained its independence in 1991, the city and the region were renamed Aqmola. The name was often translated as "White Tombstone", but actually means "Holy Place" or "Holy Shrine". The "White Tombstone" literal translation was too appropriate for many visitors to escape notice in almost all guide books and travel accounts. In 1994, the city was designated as the future capital of the newly independent country and again renamed to the present Astana after the capital was officially moved from Almaty in 1997. (2009) It was the capital of Kazakhstan (and its predecessor, the Kazakh SSR) from 1929 to 1998. Despite losing its status as the capital, Almaty remains the major commercial center of Kazakhstan. It is a recognised financial centre of Kazakhstan and the Central Asian region. (2001) [ चित्र हवे ] The capital and largest city of Turkmenistan. Ashgabat is a relatively young city, growing out of a village of the same name established by Russians in 1818. It is not far from the site of Nisa, the ancient capital of the Parthians, and it grew on the ruins of the Silk Road city of Konjikala, which was first mentioned as a wine-producing village in the 2nd century BCE and was leveled by an earthquake in the 1st century BCE (a precursor of the 1948 Ashgabat earthquake). 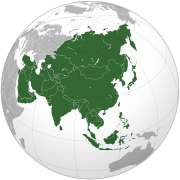 Konjikala was rebuilt because of its advantageous location on the Silk Road, and it flourished until its destruction by Mongols in the 13th century CE. After that, it survived as a small village until the Russians took over in the 19th century. (2008) The capital and largest city of Afghanistan. The city of Kabul is thought to have been established between 2000 BCE and 1500 BCE. In the Rig Veda (composed between 1700–1100 BCE), the word Kubhā is mentioned, which appears to refer to the Kabul River. (2006) [ चित्र हवे ] Peshawar is the capital of the North-West Frontier Province of Pakistan, located on the edge of the Khyber Pass near the Afghan border. In ancient times, a major settlement called Purushpur (Sanskrit for "city of men") was established by Kanishka, the Kushan king, in the general area of modern Peshawar. Purushpur emerged as a major center of Buddhist learning, and the capital of the ancient Gandhara was moved to Peshawar in the 2nd century CE. During much of its history, Peshawar was one of the main trading centres on the ancient Silk Road and was a major crossroads for various cultures between Central Asia, South Asia and the Middle East. (2006) [ चित्र हवे ] The second largest city in Iran and one of the holiest cities in the Shia world. At the beginning of the 9th century (3rd century AH), Mashhad was a small village called Sanabad situated 24 km away from Tus. It was not considered a great city until Mongol raids in 1220 caused the destruction of many large cities in the Greater Khorasan territories, leaving Mashhad relatively intact. Thus, the survivors of the massacres migrated to Mashhad. (2006) [ चित्र हवे ] The capital and largest city in Xinjiang Uyghur Autonomous Region and the cultural center of the Uyghurs. Two thousand years ago, Ürümqi was an important town on the northern route of the Silk Road, a vast network of trade routes that also facilitated cultural exchanges throughout Eurasia. (2008) The fourth largest city in Afghanistan and capital of Balkh province is linked by roads to Kabul in the southeast, Herat to the west and Uzbekistan to the north. (2008) The capital and largest city in Mongolia and the cultural center of the Mongolians. The city was founded in 1639 as an initially nomadic Buddhist monastic centre. Since 1778, it has been located in the Tuul River valley. In the 20th century, Ulaanbaatar grew into a major manufacturing centre. (2008) The second largest city in Uzbekistan and the capital of Samarqand Province. The city is most noted for its central position on the Silk Road between China and the West, and for being an Islamic centre for scholarly study. (2007) The capital and the largest city of Kyrgyzstan. Bishkek is also the administrative center of Chuy Province, which surrounds the city, even though the city itself is not part of the province, but rather a province-level unit of Kyrgyzstan. (2008) The capital and largest city of Uzbekistan. In pre-Islamic and early Islamic times, the town and the province were known as Chach. 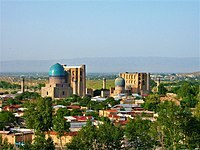 Tashkent started as an oasis on the Chirchik River, near the foothills of the Golestan Mountains. In ancient times, this area contained Beitian, probably the summer "capital" of the Kangju confederacy. Tous इराण N/A An ancient city in the Iranian province of Razavi Khorasan. To the ancient Greeks, it was known as Susia (Gr. Σούσια). It was captured by Alexander the Great in 330 BC. The city was almost entirely destroyed by Genghis Khan's Mongol conquest in 1220. (2008) The capital and largest city of Tajikistan. Dushanbe means "Monday" in Tajik and Persian, and the name reflects the fact that the city grew on the site of a village that originally was a popular Monday marketplace. (1999) The nation's fifth-largest city and the capital of the Bukhara Province of Uzbekistan. Bukhara has been one of the main centres of Persian civilization from its early days in the 6th century BCE, and, since 12th century CE, Turkic speakers gradually moved in. Its architecture and archaeological sites form one of the pillars of Central Asian history and art. (2006) The city is located in the Razavi Khorasan province in northeastern Iran, situated in a fertile plain at the foot of the Binalud Mountains, near the regional capital of Mashhad. It is the hometown of several respected Persian poets and artists, including Omar Khayyám, Attar Neyshapuri and Kamal-ol-molk. ^ Konjikala, in: MaryLee Knowlton, Turkmenistan, Marshall Cavendish, 2006, pp. 40-41, ISBN 0-7614-2014-2, ISBN 978-0-7614-2014-9 (viewable on Google Books). ^ Pulleyblank, Edwin G. 1963. "The consonantal system of Old Chinese." Asia Major 9 (1963), p. 94. या पानातील शेवटचा बदल १४ सप्टेंबर २०१७ रोजी १६:११ वाजता केला गेला.